I have been called a smart mouth before, but now it is for a good reason. 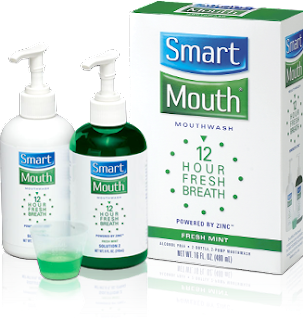 I got to try Smart Mouth mouthwash, a new, 2-solution mouth wash product that promises 12-hour fresh breath. I have a healthy obsession with dental hygiene, so I was excited to try this out. Smart Mouth is different from traditional mouth washes because it uses zinc to eliminate bad breath and prevent it from returning, rather than simply covering up odors and flavors. Plus, it is alcohol-free, so it doesn’t burn. Smart Mouth comes with two solutions that must me mixed in the provided mixing cup immediately before use to activate the special zinc ions. The mint flavor was gentle, and like I said, there was no burning at all. After using Smart Mouth regularly for the last two weeks, my mouth constantly feels freshly-brushed. You know that yucky, post-meal feeling, where it seems like you’re wearing tooth sweaters? I don’t get that at all anymore. Even when I first wake up, my mouth feels clean. I don’t smoke or drink coffee or have chronic bad breath problems, but Smart Mouth states that it is a solution for all of those problems! I just liked the clean-mouth feeling. The best thing about Smart Mouth for me was that it immediately and effectively killed garlic and onion flavors and odors. I suggest getting Smart Mouth now so that you can be extra-kissable for Valentine’s Day! Smart Mouth also has zinc-based mints, gum, and toothpaste available. It is available online at www.smartmouth.com, or you can search their site for local retailers. There is also a $2.00-off printable coupon on their site.